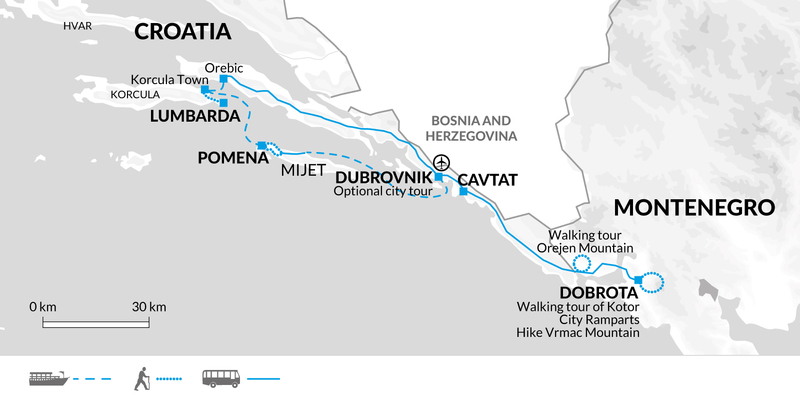 The walking holiday journeys from the Bay of Kotor in Montenegro to the idyllic islands of Croatia, following some of the most beautiful coastal, mountain and village trails of the southern Balkans. Join trip at Dubrovnik airport and transfer to Dobrota for the next three nights. Dobrota is a quaint little seaside settlement within walking distance of the walled city of Kotor. Described as one of Kotor Bays' more stylish enclaves, the seafront at Dobrota consists of old captain's villas, restored as seaside cafes and small hotels offering picturesque views of Mt Vrmac and the bay itself. This morning we explore the prettiest and best preserved city in Montenegro, Kotor. The old city of Kotor is a well preserved urbanisation very typical of the middle ages, situated on one of the world's most beautiful bays. Kotor's fortifications stand up to 20 metres high and completed their protective loop of the city by the 14th century. The walls rise improbably from the surrounding slopes and we will walk to the top of them, a steep walk of around 1350 steps, to take in the magnificent views of the fjord and the winding, maze like streets of the city itself. On our way back down from the city walls we will visit the small church of Saint Jovan before taking some free time to explore the rest of the town where you might chose to visit the Sea Gate, the 12th century Saint Tryphon Cathedral or the Maritime Museum. This afternoon there is the option to take a boat trip to the Lady of the Rock and Perast Town in the bay of Kotor. The Lady of the Rock is an artificial island created by dropping multiple rocks into the sea to lay on top of each other until an islet is formed. Legend has it that over the centuries, after they found an icon of Madonna and Child on the rocks, local seamen kept an ancient oath to lay a stone in the bay every time they returned safely. Over the years the islet was formed and now is home to the Church of Our Lady of the Rocks. Today's four kilometre trek is expected to take around two-and-a-half hours with 300 metres of ascent and descent. Today we start our walk from Kotor for one of the most scenic walks you can do on the Montenegrin coast. We walk up a zig zag meandering pathway to the top of Vrmac Mountain and then along the Vrmac Ridge that divides the Bay of Kotor and Bay of Tivat. The first part of the hike is mostly through forests, gradually ascending on the old Austro Hungarian stone pathway to a more exposed area with views of the inner bay at Kotor and then on the other side to the Adriatic and the town of Tivat. We descend from the ridge to the beach at Markov Rt for a refreshing swim in the clear waters before we return to the hotel along the small coastal road. Today's 15 kilometre trek is expected to take around five hours with 650 metres of ascent and descent. This morning we take an hours' drive to the start of our next walk at Herceg Novi. Situated at the entrance to the Bay of Kotor and at the foot of Mount Orjen, Herceg Novi - or New Castle as the name means, is another delightful example of a traditional Montenegrin coastal town. Today's walk takes us through some traditional villages and rural regions of Montenegro that most people never get the chance to see. We take a circular route out of the town with our first stop at the Savina Monastery, a Serbian Orthodox Monastery of three churches, located in the thick Mediterranean vegetation that we will be walking through. From here we will pass by the Spanish Fortress and the area of Matkovici before heading to the pasture lands of Kameno Village. Our path then takes us back to Herceg Novi via the peaceful village of Trebisinj. After our days' walking we transfer from Montenegro to overnight in the UNESCO listed walled city of Dubrovnik, Croatia. Today's 14 kilometre trek is expected to take around four-and-a-half hours with 550 metres of ascent and descent. Those who seek paradise on earth, George Bernard Shaw once wrote, should come to Dubrovnik. This morning we have a guided walking tour of this stunning area, now fully restored following damage from the shelling in the Siege of Dubrovnik in 1991-92. The Old Town still very much retains its unique atmosphere and charm and UNESCO have granted it World Cultural Heritage status as one of the world's finest examples of a fortified Medieval town. After your tour you will then have some free time to explore more of this wonderful city. You may choose to walk the length of the city walls (1940 metres in total) or take a cable car to view the city from above. We then take the boat (one hour 15mins journey) to Mljet Island, on arrival we will have a short transfer to Pomena Village where we will stay for the night. The western side of Mljet is often known as the Green Island as it is heavily wooded with over 70% of the island covered in forests. It is this area we will explore today as our looped hike starts out straight from our hotel and takes us around Malo and Veliko Jezero, or the Small and the Great Lake in Mljet National Park. The lakes are salt water and interconnected by a very narrow canal. The larger lake, Veliko Jezero, contains a small island known as Sv Marija upon which sits a 12th century Benedictine Monastery - we will take a short visit across to the island to have a look at the monastery and its church of St Mary. During its time on the island the monastery has taken on various guises, including a hotel during Tito's administration. The war in 1991 ended that particular phase and the monastery and church were left vacant with the possibility that the Benedictines may return to reclaim and reopen it. We return to Pomena before transferring to Polace for our next boat trip to the island of Korcula and our overnight stop in the village of Lumbarda. Today's 10 kilometre trek is expected to take around four hours with 300 metres of ascent and descent. Lumbarda is a small fisherman's village situated on the eastern coastline of Korcula island, well known for its vineyards and a 'unique' white wine known as GRK. Our walk today follows the shore from the beautiful sandy beaches at Lumbarda itself to the town at Korcula. On route we will get some wonderful views of the archipelago and its 22 islets, including Vrnik and Badija. We finish our walk in the medieval walled town of Korcula where we will have some free time to explore. The Old Town of Korcula is shaped a little like a fish bone with a succession of narrow streets all coming off the main street, or back bone. This design was said to reduce the effects of the wind and sun and keep its occupants sheltered. During your exploration you may wish to visit the 15th century, Gothic Renaissance style cathedral of Saint Mark or the alleged birth place of Marco Polo and its impressive tower that gives amazing panoramic views of Korcula. We then take the ferry to Orebic and transfer by road to Cavtat, close to Dubrovnik, for our final nights' stay. 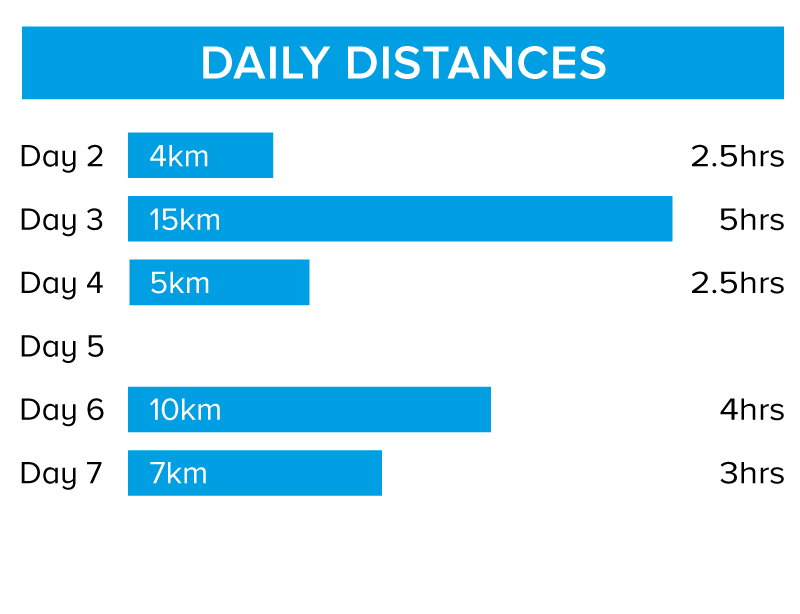 Today's seven kilometre trek is expected to take around three hours with 100 metres of ascent and descent. The summer months can be very warm, bring light and comfortable clothing that can be layered according to the temperature. It can become cool, especially at night, so also bring warmer layers. Tops made from wicking materials which keep you drier, a warmer fleece is recommended as a mid layer, and walking trousers are preferable to trousers of heavier material such as jeans. We recommend you bring walking boots/trail shoes with ankle support, make sure that your boots are worn-in and comfortable before the start of the trip. Also trainers or sandals for relaxing and general wear. We suggest that on international flights you either carry your walking boots in your hand luggage or wear them - should your luggage be lost or delayed, your own boots are the one thing that will be irreplaceable. Although entirely voluntary, tipping is a recognised part of life in this region of the world. Some local staff will look to members of the group for personal recognition of particular services provided. Accordingly you should allow approximately £15 for gratuities for local staff. Staying in simple guesthouse is a fantastic way to experience a family atmosphere and try locally produced and traditional food. Your being staying in a variety of family run guesthouses in Cavtat, as with the nature of apartments in this part of the Mediterranean the size and standard of the rooms can vary. The majority of the rooms will have a private bathroom, however, it could happen that someone may have a room with a shared bathroom if there is no other option available. Montenegro: Visas are not required by UK, US, Canadian, Australia and New Zealand citizens. Other nationalities should consult their local embassy or consular office. Walks on 5 days for between 2.5 to 5 hours. Most walks on well defined footpaths and trails through forests, along rockey coastlines and fortifications.